David Strathairn is the kind of actor you know by face, if not by name, but an Oscar nomination on Tuesday for best actor could change all that. 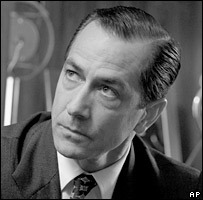 Strathairn is a classic example of a gifted supporting actor; he has starred in some of Hollywood's most popular films, yet has rarely played the lead. But with his role as US broadcaster Edward R Murrow in George Clooney's Good Night, and Good Luck, the 57-year-old actor may finally reap the rewards of years of dedication to the stage and screen. Good Night, and Good Luck sees Strathairn give a thoughtful, understated turn as 1950s broadcaster Murrow, capturing his on-air conflicts with Senator McCarthy with intelligence and integrity. Critics have called it "the performance of a lifetime". 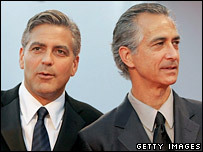 Director Clooney told reporters at the Venice film festival that within moments of Strathairn's audition, he knew he was the man for the role. "We knew he was a great actor but you still can't tell, particularly when it's playing somebody as iconic as Murrow. However, the second he was in front of the camera, and started doing some of those huge speeches, he was transformed." "I'd look up and forget that it wasn't Murrow." Director Clooney describes Strathairn, who picked up the best actor award in Venice last September, as the kind of actor "that always feels like he has the weight of the world on his shoulders". So it comes as a surprise to learn that the actor, who owes his craggy looks to his Scottish-Hawaiian roots, studied clowning in his youth. Born in San Francisco, Strathairn's interest in acting was piqued by his friendship with indie director John Sayles whom he met while studying at Williams College in Massachussets. Strathairn received his first Golden Globe nomination in December. Following his graduation, Strathairn took the unusual step of training as a clown at Florida's Ringling Brothers Clown College and spent six months working for a travelling circus. He later relocated to New York where he helped found a children's theatre, growing his acting experience by working in local theatres across the US during the summer break. During that time he ran in to his college friend, John Sayles who cast him in his first film, Return of the Secaucus 7 (widely believed to be the inspiration for The Big Chill) in 1980. The two men went on to collaborate on a number of films, including The Brother from another Planet, Matewan, Eight Men Out, Passion Fish - and perhaps, most memorably, 1999's Limbo opposite Mary Elizabeth Mastrantonio. Strathairn's turns in popular big screen hits include the role of Tom Cruise's wayward brother Ray McDeere in The Firm, Meryl Streep's husband in The River Wild and seedy millionaire Pierce Patchett in LA Confidential. His distinguished career spans 25 years and more than 70 films, but as the chain-smoking Murrow in Good Night, and Good Luck, he is finally winning some long overdue recognition. The actor lives in upstate New York with his wife Logan. He has two sons, one a university student and the other, Tay, a sometime actor, turned jazz musician.